The latest issue of De Surinoemer, dated August 2009, has been released online. It features interviews (in Dutch) with two Surinamese artists currently participating in ArtRoPa residencies in Rotterdam: Roddney Tjon Poen Gie and Ravi Rajcoomar. Edited by Dutch artist Arnold Schalks and Surinamese artist Kurt Nahar, De Surinoemer is a free journal published at irregular intervals, documenting the ArtRoPa project. It is distributed in Paramaribo in a limited-edition printed version, and online in various formats (text, PDF, JPEG) at www.desurinoemer.net. 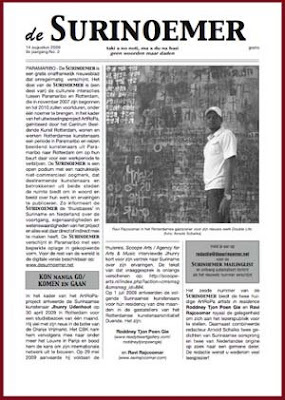 Translated excerpts from the artists' interviews in this edition of De Surinoemer will appear on Paramaribo SPAN in coming weeks.